I have a new culinary obsession: zoodles (otherwise known as zucchini noodles). When I was perusing various food blogs for a suitable new dinner recipe to try out a few weeks ago when I stumbled on Inspiralized. 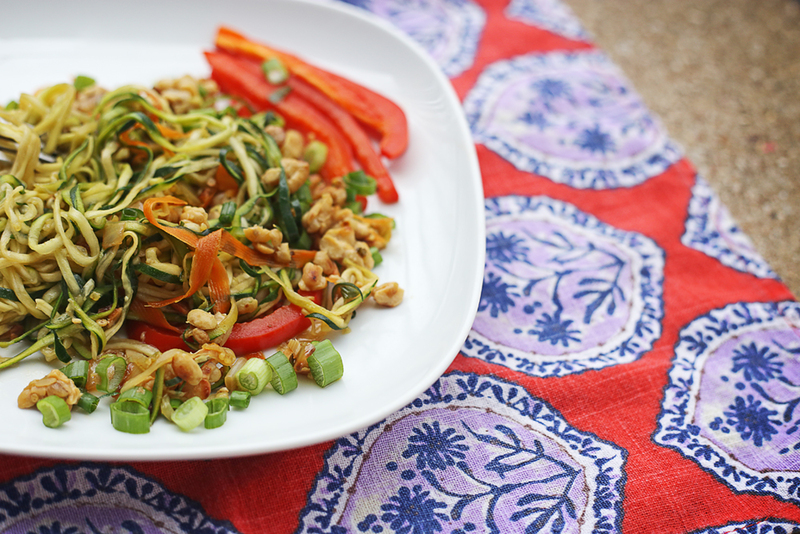 I found their recipe for vegetarian pad thai with zoodles, and I just knew that I absolutely had to try it. I had to make a Walmart run anyway to pick up a few necessities, so I conveniently added this to my list. I figured I’d try a “basic” spiralizer before committing to anything larger, so this seemed like the logical choice; it was relatively inexpensive, small to store (a big plus in my tiny 500 square foot apartment), and easy to use. I busted it out to use that very evening and had a very satisfying dinner of zucchini pad thai. And so the obsession began. Now I pick up zucchini every time I go to the grocery store because I can’t get enough of these delicious – and incredibly nutritious – little spirals of sheer veggie joy. This has become my favorite go-to dish when I’m craving something with an oriental tang to it – but not the guilt of trans fats and MSG associated with ordering takeout – chow mein zoodles with tempeh crumbles. Big shoutout to White On Rice Couple for giving me the inspiration with their original recipe. If you follow my food Instagram (which you should if you don’t already), you’ve probably seen me post an iteration of this recipe (with tofu instead of tempeh) already. 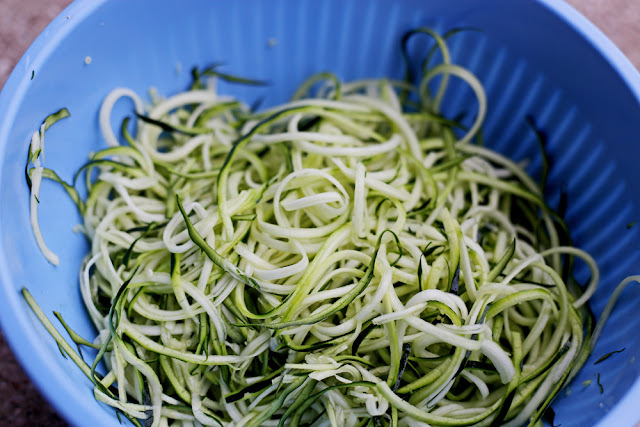 Prepare your “zoodles” by using a mandolin slicer or spiralizer. Heat about 1 TBSP of olive oil on medium high heat in a small skillet while you use your hands to break up the block of tempeh into crumbles. When the oil is hot, pour the crumbles into the skillet and cook until golden brown, about 5-7 minutes. Remove from heat and set aside. While the tempeh crumbles are cooking, prepare the sauce. Combine the soy sauce, sugar, vinegar, and vegetarian oyster sauce in a small bowl; set aside. Heat the remaining 1 TBSP of olive oil on medium high heat in a large skillet. When the oil is hot, add pressed garlic, chopped ginger, chopped scallions, and chopped onion. Cook until the onion becomes clear and the garlic and ginger become fragrant – about 3-4 minutes. Add bell pepper and carrot; cook for 1-2 minutes. 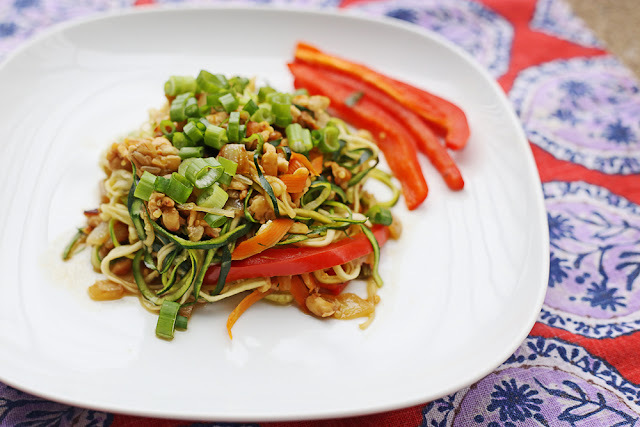 Add tempeh and zoodles; cook for 1-2 minutes. 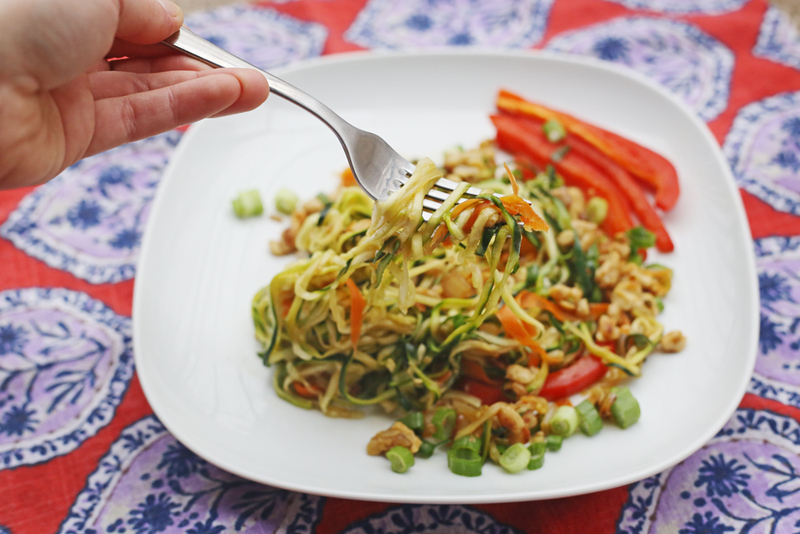 Pour sauce over top zoodles and cook for 2-3 minutes, mixing it thoroughly into the dish. Serve & enjoy immediately, with an optional garnish of scallions! Seriously y’all. I can’t even begin to tell you how much I love this dish. It’s healthy and light but immensely flavorful and the addition of the tempeh packs in some much-needed protein. Let me know if you make it and how it turns out in the comments!